"It was supposed to be a two week visit, but it turned into seven years." Joseph came to Vancouver seven years ago to visit his mother. Family ties persisted, and he decided not to return to northern B.C. -- instead, he wanted to build a life in Vancouver, where he believed work opportunities would help him get ahead. The passionate artist and handyman found a job and rented an apartment. But the excitement did not last long. "You can't work minimum wage and pay $1200 in rent," he notes, shaking his head at the problems facing many of Vancouver's working poor. With challenges from his mother's alcoholism and the discouragement of barely making ends meet, holding a steady job became difficult. 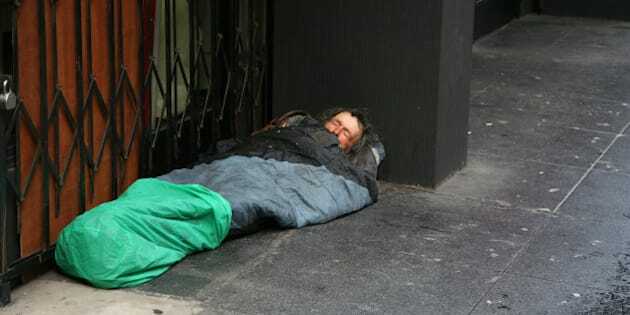 Eventually Joseph found himself living on the street without any support. Volunteers for the city of Vancouver identified 1,847 homeless residents this year, though experts estimate that the actual number is much higher. The homeless counts don't consider the other side of housing displacement, either - that long-term residents are forced to move out of their neighborhoods and cities because of affordability. "Unless you are family, it is hard to track people once they have been displaced from the community," notes Rick McGowan of Burnaby's Metrotown Resident's Association. McGowan's primary concern centers around demovictions, which have already displaced hundreds of mid and low income families in the Metrotown area. McGowan recalled the case of one senior who wasn't able to find a place to live by eviction day. He had to be relocated to Chilliwack. Current plans could yield losses of up to 3,000 more units in exchange for luxury high rises in Metrotown alone. For many, housing security simply doesn't exist anymore. 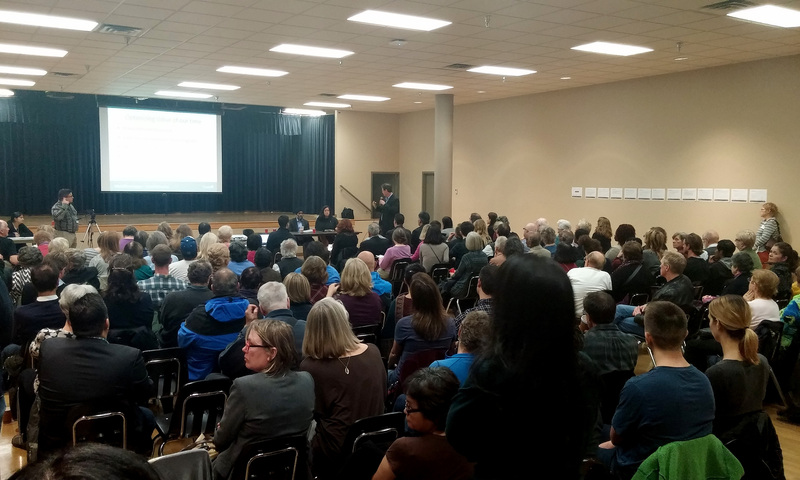 Saturday's #letstalkhousing event for residents of Vancouver-South and Vancouver-Granville attracted hundreds of concerned citizens, and there too, fears over housing security were brought up several times. When one resident implored MPs to recognize housing as a residence instead of a commodity to be traded, the room erupted in applause. The meeting closed with remarks from MP Jody Wilson-Raybould, who acknowledged the link between safe housing and human rights. The United Nation's declaration on housing as a basic human right includes protection against forced evictions, protection against the demolition of one's home, security of tenure, and equal and non-discriminatory access to adequate housing. It also includes rights to affordability. But despite Canada's commitment to following the United Nations' International Covenant on Economic, Social, and Cultural Rights, the federal government, province of BC, and the city of Vancouver have all failed to write such fundamental rights into law, pass enough legislation to protect residents, and adequately fund housing. Back in 2007, UN special rapporteur Miloon Kothari called attention to Canada's housing crisis and implored all levels of government to address the issue. Vancouver was identified as a major area of concern, with special attention called to the influence of the Olympics on real estate development. Nine years later, the situation has only worsened. It is important to remember that the housing crisis didn't simply emerge along with the UN report in 2007. In the early 1990s, the federal government awarded responsibility for managing social housing to the province of BC. The province decided whether to build new co-ops, fund new subsidies, update their existing rental stock, and implement legislation to protect vulnerable residents from issues such as demovictions. The results from that transfer of responsibility were two decades of underfunding, almost no new co-ops, prioritizing developers over residents, courting outside money, and pretending housing wasn't an issue until demonstrations in 2015 shone the spotlight on the issue. The problem was still ignored until housing dominated headlines in 2016 and became an election issue. Metro Vancouver's housing crisis won't go away until the basic right to housing is treated as such. It isn't simply a need to implement a "Housing First" program for the homeless. Housing security for both middle and low income families needs to be addressed comprehensively. Residents need to feel there is hope, and that they all have access to safe, secure, long-term housing. 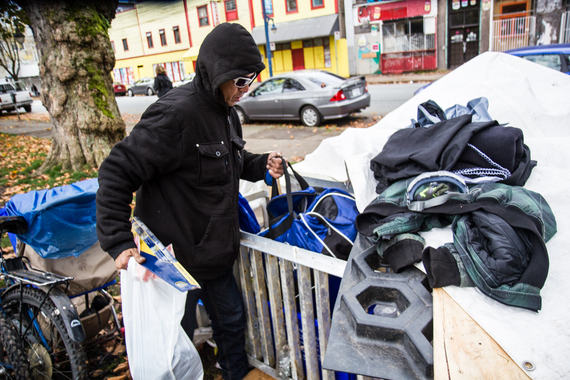 Like many of Vancouver's homeless, Joseph moves between shelters, his mother's apartment, and his tent in a park. He is industrious, explaining in detail how he likes to build things. This enthusiasm led Joseph to turn his tent into a little workshop, where he builds trailers out of discarded wood and scrap metal. He is currently constructing a miniature "workshop on wheels" so that he has a dry place to continue his endeavours. Joseph doesn't want pity, he just wants a safe, secure place where he isn't at the mercy of thefts and weather. This week, as the city ponders the right to adequate housing and hosts an international housing summit, the concept of housing as a basic human right should be on everyone's mind. This time is also an important moment for pressing the issue provincially. As the BC Greens, the Liberals, and the NDP prepare for BC's 2017 election, now is the time to push the agenda. We need citizens to implore all provincial parties to both recognize housing as a basic human right and disclose plans to adequately address it. Zarah Tinholt is a human rights advocate specializing in refugees and the Syrian crisis, a community volunteer, and housing spokesperson for the BC Green Party.